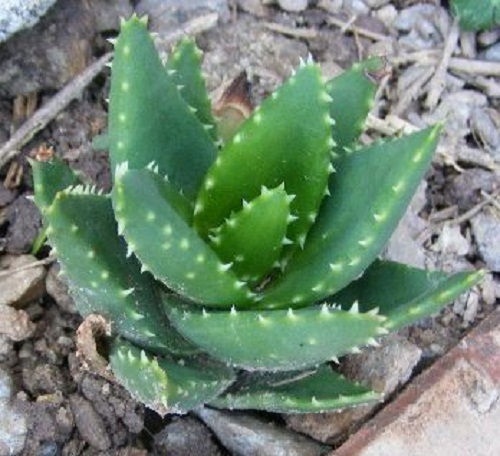 Aloe brevifolia (Aloaceae). The plants usually forms large groups of densly leaved rosettes. The leaves are broad and triangular and have a distinctly grey/green colour. One or 2 inflorescences are formed in summer with the flowers in shades of red. Sowing : The seeds germinate very well but may damp off if overwatered. Use a mixture of river sand, compost and soil to sow seeds in. Sprinkle the seeds evenly on the surface and cover with a layer of small pebbles. The pebbles help the seedlings to stay upright and prevent damping off. Keep seed tray in a dry warm corner and do not allow to dry out. Transplant the seedlings after one year. Locality : Mission.Date of harvest : June 2018.